Hello and welcome to the 9th installment of the SWD. Clashes are continuing in Al-Bab city between TFSA and IS. It appears that IS managed to recapture northeastern parts of Zamzam district after TFSA withdrawal, the latter is still in control of Zamzam mosque located in the northwestern part of the district. According to the Hürriyet, one Turkish soldier was killed today and two more wounded by an IED, full article here. Thing to note, Al-Bab operation apparently reached its 100th day. Village of Maarin near Azaz allegedly captured yesterday by SDF was retaken by TFSA. After the news broke out about Maarin situation, clashes & mutual shelling erupted along the Azaz frontline between SDF and TFSA. Some locations where shelling was reported are; Tal Rifaat, Sheikh Issa, Kaljibrin and Atmeh south of Efrin. After a few days of consolidating their gains, SAA Tiger Forces advance today capturing Rasm Al-Harmel Al-Imam and Tabaret Madi Al-Maazeh villages. 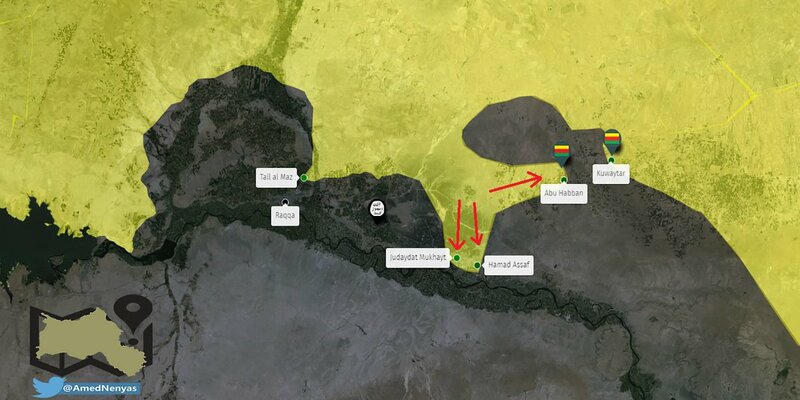 With their pattern of advances, it is still yet to be seen if they are going straight for Deir Hafer or if they will try and connect with SDF around Manbij to prevent TFSA from capturing more territory. SDF continue steamrolling IS in Raqqa countryside on multiple fronts taking even more villages in short period of time, some captured ones are; Bir Ghadban, Abu Wahi and Quwaytar. SDF also supposedly captured Jadida Khabour, if the capture is confirmed it would mean that the road between Raqqa and Deir al-Zour is cut, which is huge development. There were unconfirmed reports this morning that new military operation was launched by rebels in northwestern Hama countryside. Operation started on Kernaz with heavy shelling on Bridij and Maghair. It is strange that rebels started new operation in N. Hama after being heavily battered by LAA, then again this whole “operation” could be just a distraction to allow LAA to safely flee area without getting bombarded. Some very unconfirmed “reports” are coming from pro-SAA reporters claiming that militants in Qaboun-Barzeh have surrendered and negotiations are underway regarding their exit towards Idlib. These are very unconfirmed “reports” so take this with a very big grain of salt. 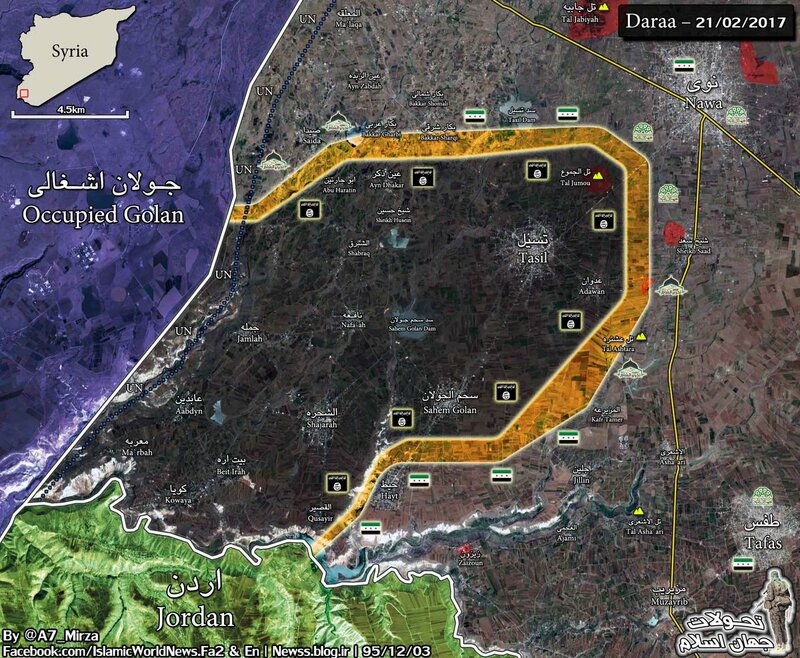 Situation in Daraa changed slightly compared to yesterday with rebel forces taking control of dam near Adwan from JKW. There is an attempt by rebels to capture Adwan back amid new reinforcements arriving, clashes are reported on the outskirts of Adwan. Yesterday’s offensive by JKW proved to be deadly with claims of at least 110 rebels killed and a dozen missing, full statement here. Not much has happened on the W. Mosul front since yesterday, Iraqi army allegedly took full control of Al-Ghazlani military camp in south Mosul, it is yet to be official declared as liberated. New stage of W. Mosul operation is expected to start in the next few days with constant reinforcements arriving. There are reports that IS moved its command center from Raqqa to al-Qaim, Iraq. Such move would seem logical as Raqqa is under threat of being taken by SDF. Euphrates area around al-Qaim and to the NW is the last region where IS still has a huge foothold and where IS is currently unchallenged. Aforementioned area could be the place where IS could have their last stand-off as a force that controls area in Syria and Iraq, following their hypothetical defeat IS would not disappear, but shift itself into an insurgency still potentially affecting both Syria and Iraq. On the 20th of February 2017 CJTF-OIR has conducted 16 strikes in Syria. CJTF-OIR‘s main focus in Syria at the moment is still Raqqa where they did 8 strikes supporting SDF‘s operation against IS destroying two headquarters, a vehicle, a command and control node, a vehicle bomb, a vehicle bomb facility, an artillery system, and a tunnel. Other areas where strikes occurred include Shadaddi, Deir al-Zour and Palmyra destroying two fighting positions & a vehicle, seven oil wellheads and an anti-air artillery system, respectively. One strike also occurred in Al-Bab engaging an IS tactical unit. Full report on CJTF-OIR strikes conducted in both Syria & Iraq can be found here.